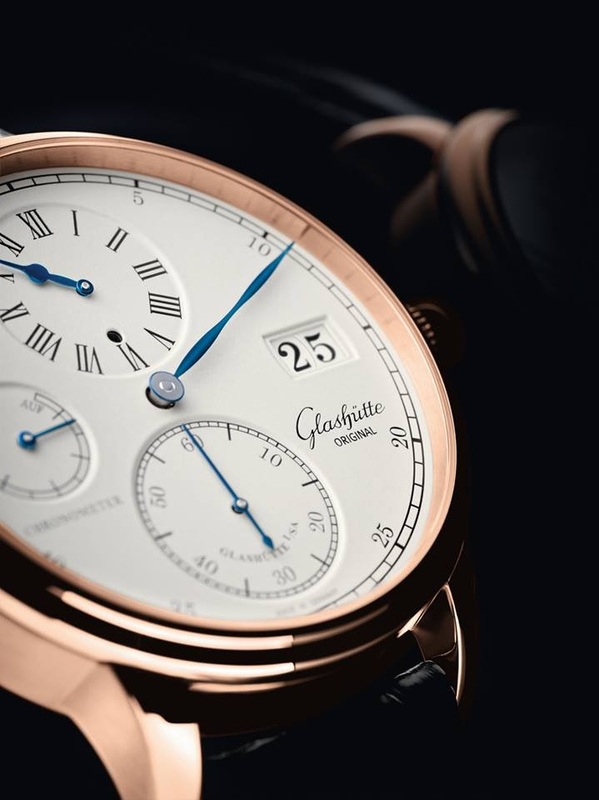 Glashutte Original - The Senator Chronometer Regulator is driven by the manual winding Calibre 58-04. The Senator Chronometer Regulator is driven by the manual winding Calibre 58-04. The precision of a watch is expressed by the quality and sophistication of its movement. The Senator Chronometer Regulator is driven by the manual winding Calibre 58-04. The movement permits the precise coordination of minute and seconds hands. Using a second-zero-stop-mechanism, it becomes much easier for the wearer to set the exact time. When winding the crown, the time display is stopped, the second hand jumps to zero and remains there. At the same time, the minute hand is also moved to the next full minute index. When one winds the crown to set the time, the minute hand always rests only on the full minute indices. This means that the correct relationship of the displayed seconds and minutes remains assured. A power reserve display positioned at 9 o’clock on the dial indicates the energy remaining in the manual winding movement. I really like this regulator. It is reassuring that the watchmakers at GO took the trouble to address the little issue of matching seconds and hour hands. Beautiful timepiece. In my opinion one of the finest regulators. I wonder if GO willl bring an update anytime soon to the Senator Chronometer and Chronometer Regulator since they have not changed in several years ... similar to what they did for the “excellence” series.